The first thing most developers think about when they hear the words “revenue” or “advertising” seem to fall in the same ballpark as the terms CPM and impressions. These old conventional methods of advertising are becoming more antiquated as new categories of applications arise. Ad pushing, interstitials, and smart-wall banner networks promise to draw in customer attention. And that is the very issue, they do just that. The old method of advertising is not only intrusive, but interferes with UI, app functionality, and affects the retention rates of your applications. Although users acknowledge the ads, they do not act on them and are bothered by their presence. These methods have a low fill-rate causing you as a developer to have a low average CPM and a bunch of angry users. On top of the root issue just described, depending on the category of your app (emoji, wallpaper, lost game, widget, etc) overlaying ads just seem to conflict with experience. The only alternative seems to attract revenue by creating a so-called “Freemium model” where users get an app for free with no advertisements but can upgrade to a premium or in-app product indirectly. I am here to tell you that these are not the only methods out there to enhance your revenue. An entirely new method of advertising is conducted using data analytics. Unlike the ad pushing method above, data analytic SDK’s run entirely in the background of any application. The entire point of this method is to draw attention to the functionality of your app so your users enjoy the experience (not how many ads can be displayed on one page). Users don’t know they are being monetized and still enjoy the app without ads. Data analytic companies are code based, meaning after SDK integration there is no UI change. If you used a conventional ad network, you would have to specify spaces for banners, and interstitials. Data analytic companies pay competitive DAU’S (Daily active user) and for users who retain your app. This means that if a user installed your app not only will the user be monetized in the app (when using it), but even when the user is out of the app! This point alone attracts many wide-eyed developers as the revenue potential far exceeds the conventional method (CPM/Impressions). Since the data analytic SDK’s run in the background, they are also compatible with other methods of advertising. By integrating with a data analytics company, you are tapping into an entirely new revenue stream that would not have existed before. When I started developing my live wallpapers, I used the conventional approach (integrating Airpush). Due to the conflict of interest between wanting to push ads and user experience my CPM was very low. From over 19 million impressions at a .18 average cpm, roughly $2,000 was generated. I turned to a location analytics company and now my apps make much more $40 per 1,000 DAU per month. 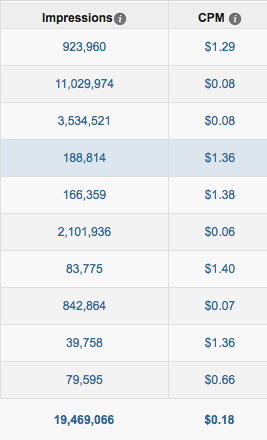 Aside from the high revenue turnout, my retain rate has increased by 20% (due to no ads, and my customers are happy).